Preston ‘Puzzle Man’ Wallace, Jr. Puzzle is known for songs like Barefoot Bandit, Sour Vibes, Jobless, Mommy I Pregnant, Animal, Vote For Me and many others. 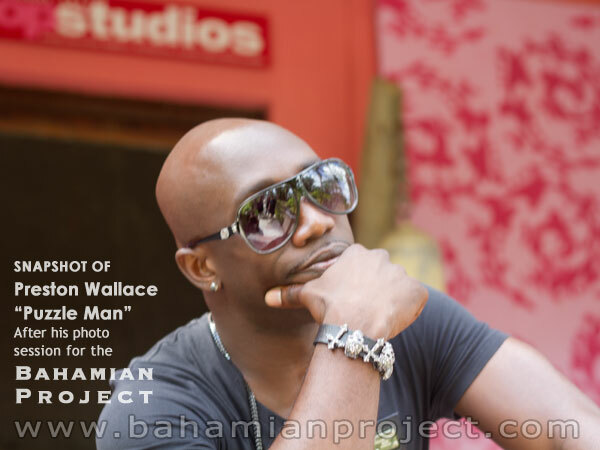 He has his finger on the pulse of Bahamian society, documenting current events and our societal realities through catchy lyrics and melodies. Born in Nassau as Preston Wallace Jr. his interest in music began in the church at a young age. He says he was born into the church, grew up in the church and sang in the church. Over the years he developed an appreciation for all genres of music and a passion for singing, songwriting and producing music. Since October 2012, he has been working at The Ministry of Tourism as The Director of Entertainment, a job which fits him like a glove. He is a charismatic communicator and a forthrightly positive individual who enjoys interacting with people. With Puzzle in our studio, we enjoyed an inspiring, uplifting power-chat that vibrated with motivational energy. Puzzle believes that you make things happen for yourself. He talked about the laws of attraction and spirituality – about the importance of speaking positivity and the power we have over own lives. Please contact us about bringing your exhibition to our property in the wynwood art district in Miami soon.